In The Scream Heard Around the World–Manila, Part 1, we saw the far-reaching effects of a speech given by Carlos Cespedes in Cuba and how it spawned a movement for freedom in both Cuba and the Philippines. In The Battle That Wasn’t–Manila, Part 2, we looked at how the reach of that scream carried on through a poem by Dr. Jose Rizal and influenced the course of a nation. In A Nation Becoming and the Battle for Manila, we investigated the challenges the budding Philippine nation faced, as well as the WWII Japanese invasion and the Bataan Death March. Today, we review the Japanese occupation of Manila, WWII, and the realization of Dr. Rizal’s dream. After the Japanese defeated the main formations of U.S. and Philippine forces at Corregidor in May of 1942, it took them two more months to defeat them on the other major islands. Throughout the Archipelago, a few thousand U.S. and Philippine forces that had managed to avoid death or capture served as nuclei for the formation of various guerilla groups. By way of submarine delivery and a few airdrops, the Allies were able to keep them supplied with weapons, ammunition, explosives, radios and medicine. A few additional U.S. troops were inserted into the islands to help organize and coordinate the various guerilla groups. The allied guerilla activities caused the Japanese to retain more infantry and aircraft in the Philippines than they had intended. With airpower, the Japanese were able to prevent the guerillas from billeting in large formations or moving on roads and trails except at night. Though the guerillas were usually unable to cause significant casualties to the occupying Japanese troops, the drain on Japanese forces further hampered the Japanese advance to the South and the Southeast. This helped the Allies in coming to grips with the Japanese in New Guinea and the Solomon Islands. By the middle of 1944, General MacArthur’s Southwest Pacific Command (SWPC) had managed to leapfrog its way up the northern coast of New Guinea. In September, Allied forces captured Morotai in the Dutch East Indies. The Allies quickly built a large, reinforced runway on the island, which provided SWPC with a valuable base of operations for heavy bombers and long-range reconnaissance against the Japanese forces in the southern half of the Philippines. The U.S. Navy sent carrier groups under Task Force 38, commanded by Admiral William Halsey, to conduct repeated raids against the various Japanese airbases in the central and northern Philippines. The raids were highly successful in destroying Japanese planes at a surprisingly low cost to the pilots of TF 38. The Allied Combined Chiefs of Staff (CCS) had allocated resources to SWPC for an invasion of the southern Philippines in late December. Halsey and his staff were convinced that Japanese airpower had suffered a terrible attrition not just in numbers, but also in declining quality of pilots. 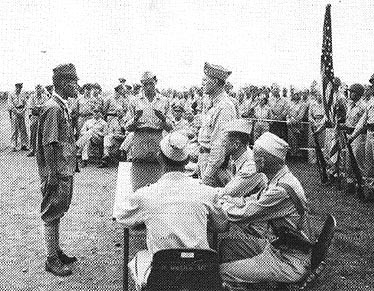 Based on intelligence information from guerilla groups throughout the Philippines and on the minimal opposition that pilots had faced during their repeated raids, Halsey felt certain that the U.S. invasion of the Philippines should be moved up from December to October, and that they should strike in the central Philippines to quickly defeat the main Japanese formations. General Douglas MacArthur concurred with Halsey’s assessment. By 1944, based on Admiral Halsey’s many successes against the Japanese, his reputation had grown to epic proportions, and he had the trust of both the CCS and the Allied political leaders. Wisely, MacArthur left it to Halsey to make the recommendation to the CCS that the invasion timetable be moved up. 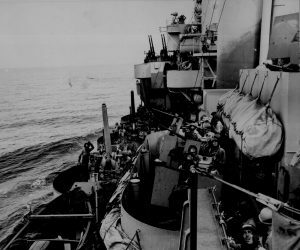 With offensive operations taking place on multiple fronts from Europe to the Pacific, the competition for supplies and shipping to support operations was a limiting factor in Allied offensive operations around the globe. Halsey’s reputation carried the day, and the CCS quickly agreed to his recommendations. On October 20, 1944, the U.S. Sixth Army landed on the eastern shore of Leyte, northeast of Mindanao Island. The Japanese general staff underestimated the strength of the U.S. forces supporting the invasion. In conjunction with waves of kamikaze air attacks, the Japanese launched a complicated, three pronged attack with the majority of their remaining naval ships in an attempt to destroy the U.S. landing forces. A series of large naval battles ensued from October 23 through 26. The combined might of the U.S. surface ships, carrier planes, and submarines ensured a disastrous defeat for the Japanese Navy. The defeat was so complete that the Japanese Navy was never again able to attempt any major engagements for the remainder of the war. Henceforth, the entire Japanese Navy became a kamikaze force. Once the U.S. 6th Army was ashore on Leyte Island, the Philippine guerillas attached themselves to them, volunteering to handle scouting and sabotage missions. The newly supplied guerillas were able to befuddle Japanese defensive maneuvers on Leyte by blowing up the right bridges and telephone lines at just the right time while the 6th Army conducted its offensive. Their efforts undoubtedly saved thousands of U.S. lives. 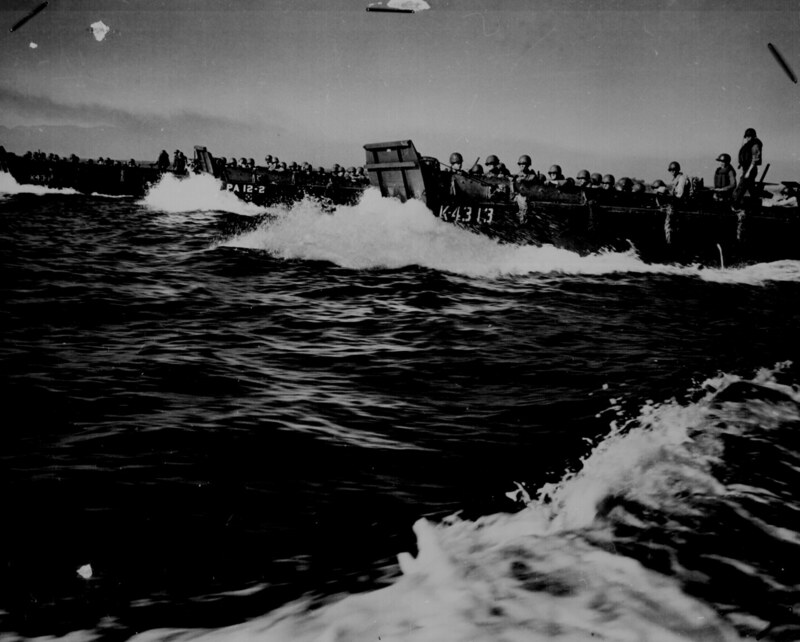 Although fierce fighting by well dug-in Japanese troops continued for several months, the 6th Army was able to launch an attack on nearby Mindoro Island on December 15, 1944. Mindoro Island is located south of Luzon, and it offered a perfect location for fighter bases to support any future operations against the large Japanese Army formations on Luzon Island. The Japanese had expected the next assault to come elsewhere, and they had not reinforced their garrison on Mindoro. The results of their miscalculation were disastrous. The 6th Army had complete control of Mindoro by December 18. To confuse the Japanese about allied intentions, Philippine guerillas conducted major sabotage operations in southern Luzon while the U.S. conducted air raids against southern Luzon. When U.S. minesweepers appeared in southern Luzon harbors the Japanese were convinced that a landing and would soon be conducted. It would, but in another area much further north. 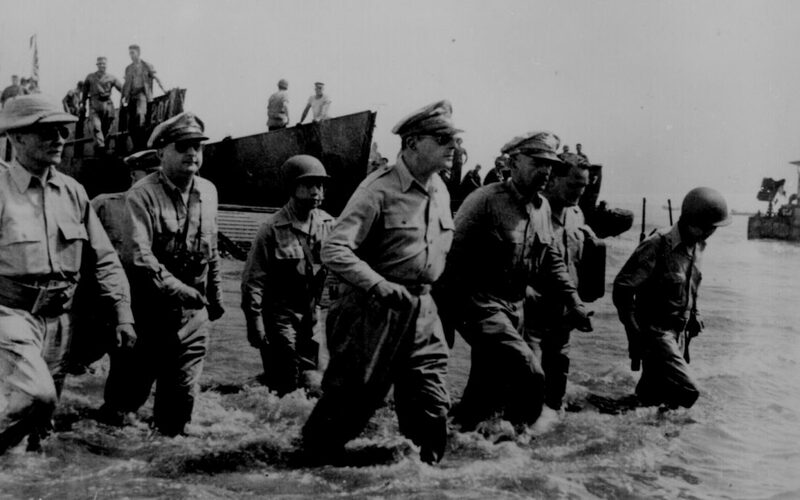 On January 9, 1945, U.S. forces stormed ashore at Lingayan Gulf. The surprised Japanese offered little resistance. In an amphibious assault that out-scaled the Normandy landings, the U.S. landed 176,000 troops within three days. Japanese General Yamashita, the Tiger of Manila, could see a very effective trap for his army forming in southern Luzon, and he ordered half his army to retreat to the northern mountains of Luzon while the other half moved to block the expected allied assault on Manila. Yamashita hoped to minimize the U.S. advantages of complete air supremacy and armored formations by fighting a prolonged defensive action in the mountains of northern Luzon. It was a wise move on his part. In the late hours of February 3, the lead elements of the U.S. 1st Cavalry reached Santo Tomas University on the outskirts of Manila. The campus had been used as a prison for U.S., Philippine, Australian, New Zealand, and Dutch civilians. The U.S. troops were shocked by the emaciated condition of the prisoners. The nightmare was just beginning. Before they could be ensnared, General Yamashita took his southern force out of the Luzon area to join the rest of his army in the north. Before Yamashita had left Manila, he placed Vice Admiral Denshichi Okochi in charge. He ordered Okochi to destroy the port facilities, declare Manila an open city, and escape northward. MacArthur’s staff ordered that fire from tanks and artillery only be used selectively and at close ranges to avoid as many civilian casualties as possible. Sadly, an estimated 1,200 Filipinos died from U.S. fire. Sadly, that was the least of the suffering for the inhabitants of Manila. Admiral Okochi had ignored Yamashita’s orders. Instead of leaving, he used his force of 20,000, consisting of Naval Special Troops and other naval and army troops, to make a last stand in Manila. In a war defined by ruthless Japanese atrocities, Okochi and his men engaged in one of the worst atrocities of the war in the Pacific. Women of all ages were raped and murdered. Hospitals were set afire with patients tied to their beds. Babies were torn from their mothers’ arms and mutilated. It took the allied forces another month of non-stop, heavy urban fighting to clear the Japanese from Manila. In the final hours of the battle, Admiral Okochi and his staff committed ritual seppuku. At his orders, his forces had raped, tortured, mutilated and murdered about 100,000 Filipino civilian inhabitants of Manila. The fighting reduced most of the city’s historical buildings to rubble. Allied commanders had grown accustomed to the Japanese military’s barbaric crimes. However, Okochi’s savagery against civilians in Manila and the many other war crimes committed against Philippine civilians and POWs further inflamed Allied anger against Japan and ultimately helped President Truman make his difficult final decision to use atomic bombs against Japan in August of 1945. On February 27, 1945, Manila was considered safe for the return of the Philippine government. At Malacañang Palace, a formal ceremony was conducted to install Sergio Osmeña as the President of all of the Philippines. The last pockets of Japanese defenders were not cleared until March 3. At a horrible cost, Manila, or the little that was left of it, was now free. Fighting continued in the Philippines until after the Japanese surrendered on September 2. About 15,000 Allies had lost their lives. Fighting against superior U.S. firepower and U.S. air supremacy, the Japanese had lost about 338,000 soldiers and sailors. During the Japanese occupation of the Philippines, about one million Filipino civilians were murdered or lost their lives to starvation and Japanese abuse. After the war, the Philippine people rebuilt Manila into a capital city. The ground beneath the city is considered by the Philippine people to be their most sacred ground. In 1946, fifty hard years after revolutionary scholar and poet Dr. José Rizal left his goodbye poem to Manila, My Last Farewell, in his prison cell on his execution day, the Philippine people received their independence. His dream was finally realized. What a terrific report !! Hi Mr. Mean Genes. Thanks for visiting. I’m glad that you enjoyed it.